Blush Lace Bachelorette Sash - Gold Bride To Be by Lauren Lash Designs at Nicky's Blog. Hurry! Limited time offer. Offer valid only while supplies last. Bachelorette Sash - Bachelorette Party - Bride To Be Sash - Bride Gift - Classy lace bachelorette sash for the Bride who wants something unique! Bachelorette Sash - Bachelorette Party - Bride To Be Sash - Bride Gift - Classy lace bachelorette sash for the Bride who wants something unique! These handmade sashes make a perfect gift that she can hold onto and cherish long after walking down the aisle. Each of our sashes are handmade in our Houston studio. 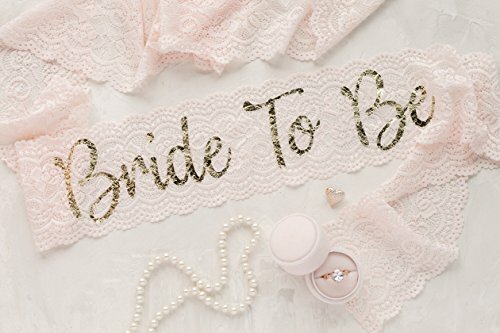 Luxurious soft blush lace make a gorgeous sash with gold "Bride To Be" in a beautiful calligraphy font. Wording it professionally heat pressed assured to last for years to come. These sashes are made extra long measuring at 72" and clasp together with a pin to keep the sash in place all night. This Lace sash is a semi sheer translucent material, that can be worn to not take away from the brides outfit but to add a special touch. Packaged in a delicate organza bag, ready to gift. If you have any questions about this product by Lauren Lash Designs, contact us by completing and submitting the form below. If you are looking for a specif part number, please include it with your message. Ivory Lace Bachelorette Sash - Rose Glitter "Bride To Be"